Update 8/5/16: Thanks for stopping by our Black Hat booth! Check out these awesome caricatures of some of our booth visitors! Returning for its 19th year in sunny Las Vegas, the Black Hat USA conference is deemed one of the most technical and relevant information security events around the globe. Every year, thousands of attendees—ranging from security executives and recruiters to law enforcement and academia—come together to discuss the latest in security risk, research and trends. The event begins with four days of intensive training for practitioners, including hands-on attack and defense courses taught by subject matter experts. Next, the conference offers two days of briefings, where more than 100 distinguished security professionals will present their groundbreaking research. With the 2016 conference just days away, here’s a look at what Tripwire has in store for you. Specific steps you can take today to help detect and contain endpoint threats. How our security solutions can maximize your total cost of ownership. Ways to reduce compliance costs while remaining confident in your safety. 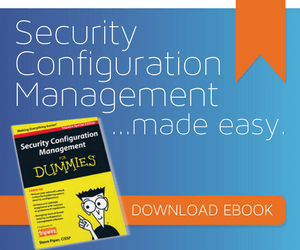 Also, don’t forget to pick up your free copy of our eBook, Endpoint Detection and Response for Dummies. We’ll be giving our booth visitors the chance to win incredible prizes, including BB8 robots and drones. Plus, choose from four of our all-new 2016 t-shirt designs – pick yours up while supplies last. Finally, and certainly not least, be sure to get your very own security defender caricature! Check out our in-booth speaking schedule below, including customer success stories and a look at our technology integrations with Blue Coat, FireEye, Crowdstrike and more. You Got VM Data In My Log Analysis Tool! Tripwire is pleased to be sponsoring BSidesLV once again this year. Be sure to make and appearance and hear from many great names in the industry, including Security BSides co-founder Jack Daniel and TED Talk veteran Keren Elazari. 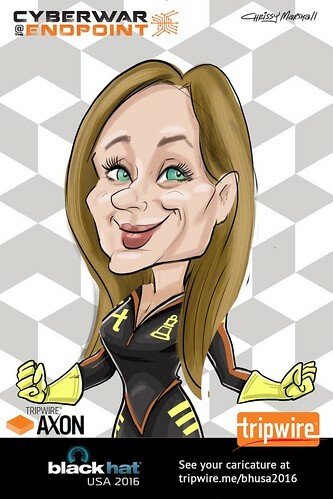 Find our talented caricature artist there on Day One to get yourself sketched in full security defender mode. For those of you sticking around for DEF CON 24, you can learn from Tripwire senior security researcher Craig Young, who will be teaching a workshop on how to “brainwash” embedded devices. For more information on this workshop, read Young’s blog post here.